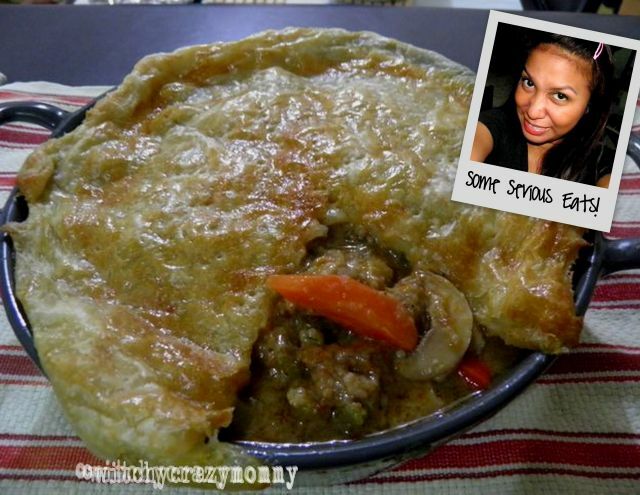 I have always been amazed by people who can cook Pastel or Pot Pie. It's one of those dishes that we just order since it seems too complicated to cook. Today, I've decided to christen my kitchen with some massive cooking and got the balls to cook Beef Pastel. I got part of the recipe from Yummy's March 2011 issue and the rest I decided to wing it. Before anything, this recipe calls for a strong and patient heart since there's 3 major cooking parts and you'll need a large pan and a stock pot. 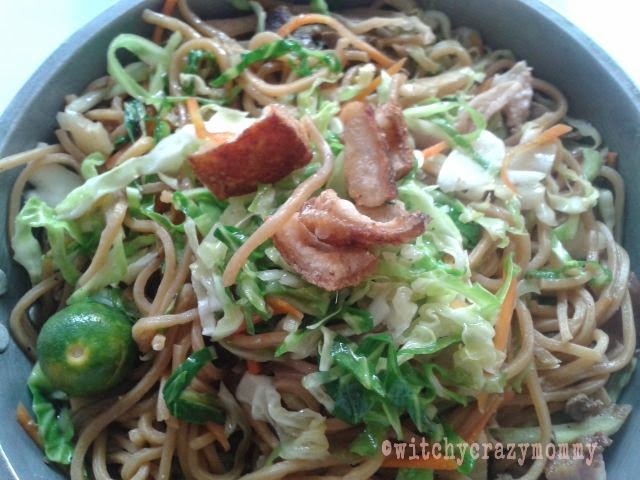 Not to be prepared when your hungry either, it's one of those Pinoy dishes that taste better when eaten the day after. 1. In a large pan, heat some olive oil and brown the meat in all sides. Searing the beef ensures all the flavors and juices are locked inside. Do this in small batches so you don't overcrowd the meat, I mean if you are in a hot, tight space with other cows, would you like it?! 2. Once all the meat is seared, set them aside in a bowl, in the same pan pop in the garlic, onions, half of the bell pepper cubes, grated carrots and celery. You ask why the grated carrots? It makes the dish mildly sweeter, thickens the sauce and ensures that picky eaters get at least some of their veggies. 3. Wait about 2 minutes for the veggies to sweat, you can tell this is done by looking at the onions change to a lighter color. Put the beef back into the pot and stir it together with the veggies. Now for the next part you need to get your stockpot ready. 4. Pour in 1 liter of water in the stockpot, pop in the beef bullion, soy sauce, cooking wine, spanish paprika, sugar, ground pepper and salt. Once the bullion disolves, pour all the meat and veggies into the stockpot and cook in very low heat. Let it simmer for 2-3 hours until the beef is fork tender, add more water if needed. Cooking it slow makes for really tender meat and the flavors meld well together. Once you got the beef tender, put in 1 cup bread crumbs, I used chopped up old bread for this recipe. 5. Simmer it for about 5 more minutes until the breadcrumbs absorbs the liquid and you have a thick sauce.Taste your dish and adjust the flavors according to your preference, cover the pot, turn off the heat, let it cool and put in the refrigerator overnight. Yes, overnight! While cooking this I think we had too much tasting, hubby and I even ate it with rice at this point;-). 6.The next day, heat a some butter or oil in a pan and fry the potatoes, about half-way through add the carrots, broccoli, mushrooms and half of the bell pepper from Part I. 7. After about a minute add the braised beef and mix well together until all the veggies are covered with the sauce. At this point, add the olives and about half a cup of milk and let simmer for about a minute more until you have a creamy, thick sauce. Place it in a baking dish, I used a 10 inch round stoneware. You can already eat it at this point, really. 8. 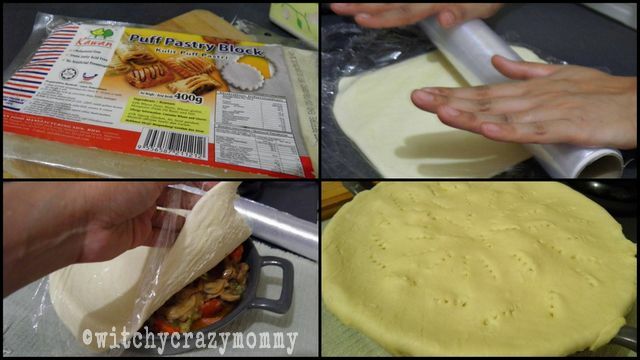 Thaw the puff pastry for about an hour in the ref before you need to use it. For this recipe I used only half a block. Roll out the pastry with a rolling pin, or in my case a cling-wrap roll (can't find mine, I blame it on the move). I find rolling it covered in cling-wrap is less messy, no need for flour and it's easier to lay out on the dish. Punch some holes on the pastry after covering your baking dish to let the air out. 9. Don't forget to brush the top of the pastry with an egg wash, this will give it a nice & shiny golden brown color. 10. Now you have your dish ready for baking, this I think is the easiest part of the whole thing. Pop the dish in a pre-heated oven at 350ºF for 20 minutes or until the pastry puffs and becomes golden brown. In my case, I used a turbo-broiler so I did not need to pre-heat. Tadddddaaaaah! Whew! Ten steps and were done. I was pretty sure it was good not only because I couldn't stop eating it but also because my niece and nephew couldn't stop making lip-smacking "mmmmm" sounds while eating. Totally worth the effort! I want to be able to cook that, but the thing is, I don't have an oven. Maybe that's one good reason for me to get one. That pastel looks really yummy in so many ways. The top pa lang looks good na! Hi, I want to try this recipe, Please share the temp and time you cook this in turbo broiler. Many thanks! @Donna - Hi, I used 350F for 15 minutes or until your puff pastry is golden brown. I usually follow the temp for conventional ovens but reduce the cooking time by 5 minutes or so when cooking in a turbo.